As you may have read, we’re crossing the desert right now. It’s warm out here. Really warm. And beautiful though it may be, the desert doesn’t exactly go out of its way to be friendly toward walkers, but we’re making the best of it. To keep the updates rolling along, once we left Fallon, we continued east toward Utah. Even though it may be hot, we’ve had some great experiences. 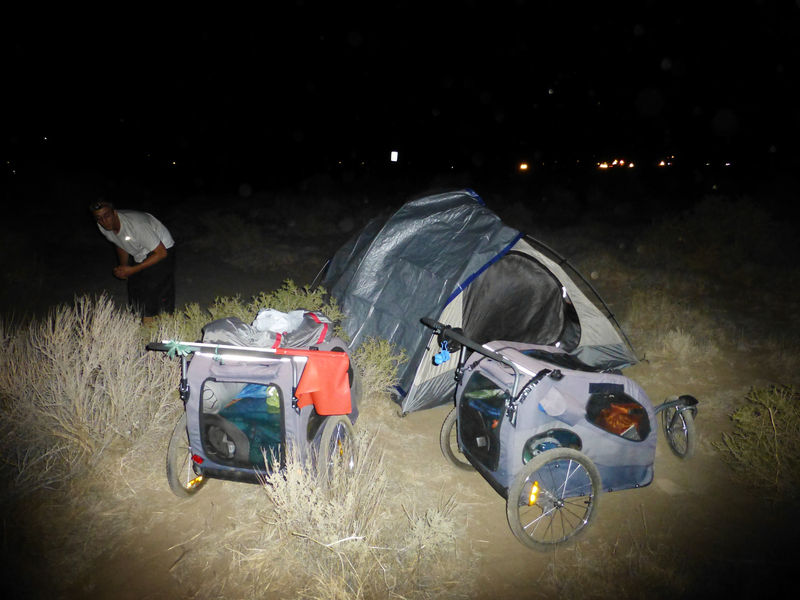 For starters, we’ve done plenty of stealth camping along Highway 50. Mostly because there aren’t a lot of people to stay with, places to campsite camp, etc. between towns. In fact, there’s not a whole lot of anything between towns, other than emptiness. That said, it seems emptiness is good for the soul, because Lindsie and I both feel like our heads are clear out here in the desert. Lindsie’s often said that this portion of our journey reminds her of her favorite part of Hosea, in which God says he will take Israel out into the desert and strip her of all her distractions (it’s in Hosea 2 if you’d like to look it up), and I’m pretty sure Lindsie couldn’t be more accurate. With nothing out here to distract us, it’s much easier to focus on the things that really matter. Sometimes we don’t even have cell phone service, which means we can’t pull up Twitter or Facebook to get distracted with. It’s just us, Jaeda, the sun, and God most of the time, with an occasional car driving by every 10-15 minutes. Anyway, back to filling you in on our recent activities. 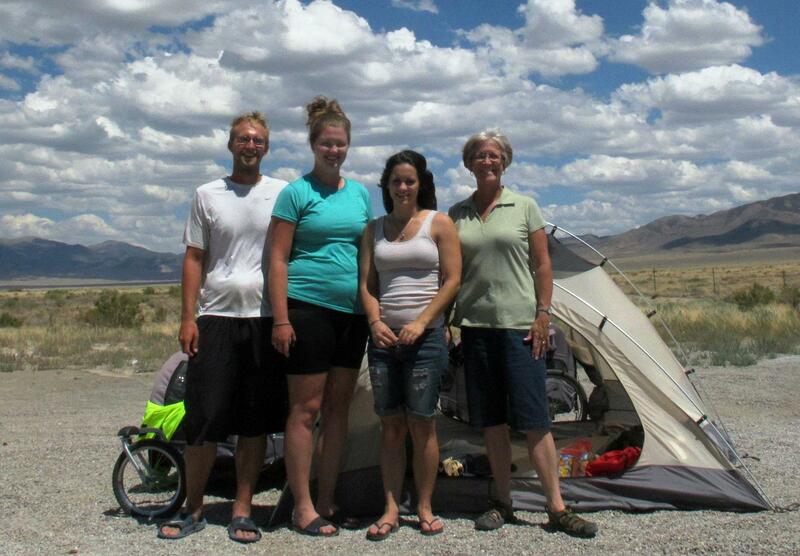 We left Fallon over a week ago and have continued walking east along Highway 50. 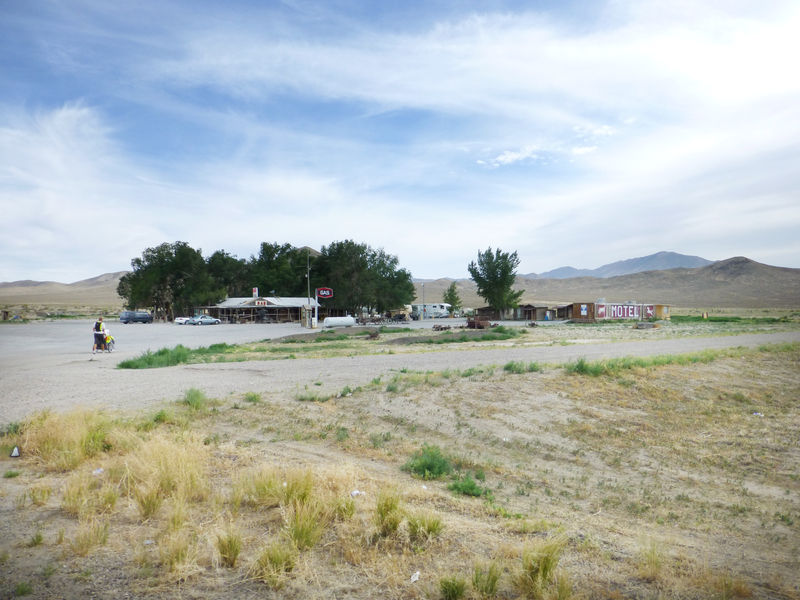 After a couple nights of stealth camping, our first stop outside of Fallon was Middlegate Station, which is pretty much a combination of restaurant, bar, motel, and a single gas pump. Just having an opportunity to shower after three days was wonderful, and being able to eat real food and sleep in a real bed made it extra enjoyable. Due to Lindsie having a bit of heat exhaustion, we actually stuck around an extra day in Middlegate, which was nice. Thankfully the motel was cheap enough (only $35 a night) that our bank account wasn’t hit too hard by the extra stay. From there we moseyed on down to Cold Springs Station, which was a short, 14-mile jaunt down Highway 50. In a wonderfully-blessed bit of God’s handiwork, Lindsie’s mom’s cousin, Nancy, and her daughter Deanna happened to be in our general vicinity. You may remember Nancy and Deanna from this post where they met us in Davis, California, paid for a hotel room that they let us share with them, and bought us dinner. Thankfully, they were equally as wonderful in Cold Springs Station, paying for our campground for the night, buying us a delicious meal, and, most importantly, driving on ahead of us and doing water drops for us on our next stretch of road. You may be wondering, what’s a water drop?, so here’s the explanation. A gallon of water weighs 8 pounds. It’s been recommended to us that we drink a minimum of 2 gallons per day out here in the desert. Some of these between-town stretches can be anywhere from 50 miles long to 80 miles long. That means anywhere between 2-6 days of walking in the desert with no water fountains, gas stations, or rest areas to fill up with water before the next stop. If you might have 6 days of walking, that’s 12 gallons of water EACH. When you do the math, that ends up being about 96 POUNDS of water each. Our carts max out at a 115-pound weight limit, and they have about 60-70 pounds of stuff in them without the water. Essentially, we aren’t able to carry enough water with us every time without running the risk of breaking our carts. So, as you can see, water drops are incredibly helpful out here in the desert. Beyond that, having the water dropped off ahead of us means our carts don’t have to weigh a ton when we’re pushing them up the 7,000-foot summits we come across here in the desert. So with a heart full of gratitude, we said goodbye once again to Nancy and Deanna and prepared to leave Cold Springs Station on a 50-mile stretch to Austin, Nevada. We were excited to head out on a really-rely-on-God-because-this-is-a-longer-than-usual stretch, even if it did mean early morning wake-ups and late night walking. Although Lindsie and I enjoyed great conversation (and enjoyed listening to audiobooks) during this part of the journey, there’s not exactly a ton to report about it. We were sort of out in the middle of nowhere, we were stealth camping every night, and we didn’t really see anything earth-shattering. We did, however, come across some great road angels during our Cold Springs Station-to-Austin stretch. For starters, we came across a gentleman named Jeff Martin, who worked at a military facility along that stretch of road. He and his wife had seen us walking for a few days, so he kindly dropped off a cooler full of ice, Gatorade, iced water, PayDay bars, and gum. It was such a blessing because most of our water had heated up from the sun and the difference between ice cold water and lukewarm water when you’re out here in the desert is very noticeable. Plus, we were able to use the cooler for another week, filling it up with ice whenever we could and having cold water more regularly. 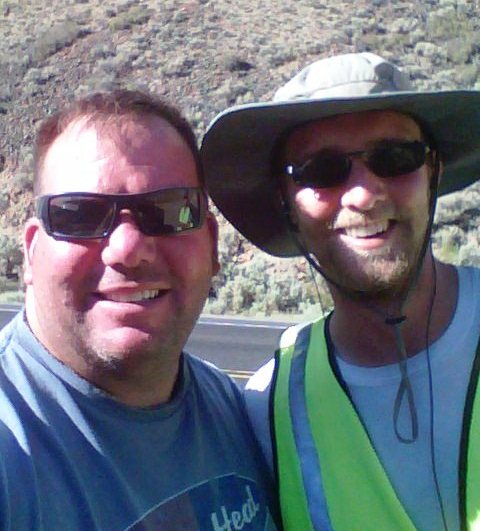 Later on during that part of the journey, Mike Green, one of the guys we’d met at Parkside Bible Fellowship in Fallon, saw us on the way out to a weekend trip and dropped off several cold bottles of water for us. Then, coincidentally, we ended up seeing him again after his weekend trip and he gave us the rest of his leftover bottles and ice, which made for a double whammy of cold waters during hot stretches of travel. We also met a gentleman named Rich DeBraga while we were taking one of our midday breaks and he dropped off some deliciously cold iced waters, some Arizona tea, and a friendly word of encouragement. We ended up seeing him a few days later and he dropped off even more water for us, which was fantastic. It’s crazy how, even in the middle of nowhere, God puts people in your life to help give you that boost of cold water, love, and support just when you need it. It seems like so many people were willing to help us for no other reason other than “you look like you could use some cold water,” which is such a blessing when you’re out there sweating in 95-degree heat with lukewarm—or just completely warm—water in your cart. Anyway, after a few days of travel, we reached Austin, NV. Unfortunately, right before we got to Austin, we got caught in a very uncharacteristic downpour. The night before arriving was rough, but thanks to some help from a few more road angels, we got our tent up in the whipping wind and rain. The next day was sort of clear, and we thought we’d get to Austin before it rained again. Unfortunately, about 4 miles outside of Austin, we got destroyed by rain. We didn’t have time or a place to put up our tent, so we got out tarps, covered the carts, and then tried to cover ourselves. It wasn’t fun. It cooled things off, but it rained for so long (again, uncharacteristic of the rain out here) that we started to get cold. And we were already wet. As soon as the sky cleared up, we powered up the hill into Austin and found some food. We were trying to stay with some people in Austin but weren’t able to connect with anyone, so we made our way down to a motel in town. Unfortunately, we got yelled at pretty aggressively by the guy who runs the Pony Canyon Motel for “doing video” and “using up 1000 megabytes in an hour” on his internet (to be clear, we hadn’t “done video” for even a second, but that’s ok), so we decided to call it a day and get on out of Austin. We stayed at the Bob Scott Campground a few miles outside of town for a couple of nights to rest and enjoy some time to just hang out with each other in a beautiful, quiet, open area. The next stretch of road was our biggest without any water or rest stops along the way. From Austin to Eureka is 70 miles, and Lindsie and I were both excited and slightly intimidated by the distance, but we knew if there was a time we’d need to rely on God, it would be now. On the plus side, it’s always gorgeous in the mornings and evenings (as you can see from the photo). Once again, this post is getting long, but I can say that we DID end up having to rely on God during the Austin-to-Eureka part of the walk, and I’m excited to share exactly what happened in the next post. 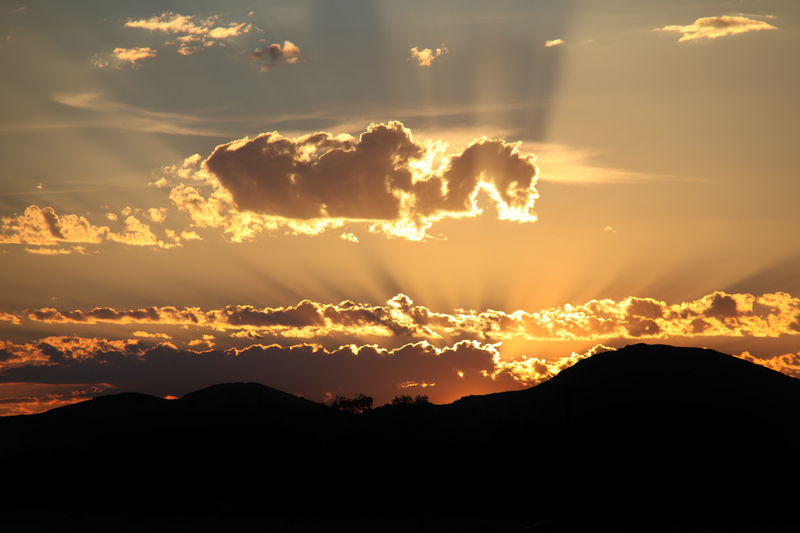 Not only did we have to rely on God, but he provided more abundantly than we ever could have dreamed. We’ll be trying to use up the internet here in Eureka as much as we can before setting out, so we’ll try to have another post ready to go before we take off. We also have plenty of other stuff to share/reveal in the next few days, so we’re pumped to finally have internet access again. Thanks for reading these posts and for leaving encouraging comments here on the blog and on Facebook. We can’t tell you how much we appreciate the love and support we’ve been shown on this journey. It has made every step even more worthwhile than we could’ve ever imagined. Back with more soon, as usual. I get so excited when my email pops up and I get to read about your journey, I usually get the updates while at work, I stop everything to focus on reading with my full attention. You are an inspiring, strong , adventurous couple who I admire. I am keeping you in my prayers. Stay safe. Thank you so much, Michele. That’s inspiring to hear and we’re definitely blessed to have you following along. Thanks for keeping us in your prayers and we look forward to sharing more updates whenever we can! P.S. – We’re glad we can help distract you from work a little bit too. Ha. He’s not looking for anything. He’s hiding from cars driving by. I love reading your updates! Thanks for sharing this amazing adventure with us through your words and photos (journalism at work)! God’s provision on this journey is incredibly inspiring and encouraging, particularly this desert travel! I will continue to keep you both in my prayers!